LightCam can be used for many reasons such as security, nanny cam, spy cam, or just give peace of mind a home is good while away. Wifi cameras come built into many things these days from clocks to light bulbs. twist it in to get latest smart security features. packages and visitors ,and not very time the wind blows. LightCam has No contracts contracts ,monthly fees ,or frustrating restrictions. Live FHD 1080P VR 360 wind angle video right to your phone anytime ,anywhere . Apps are include that give real time video and two way communication if needed on a smartphone or tablet. ✅[Easy to setup and Operation]- Good Ideal for home security system, it can work like a wifi IP camera but more usefully .Don’t need any wire to setup the camera . 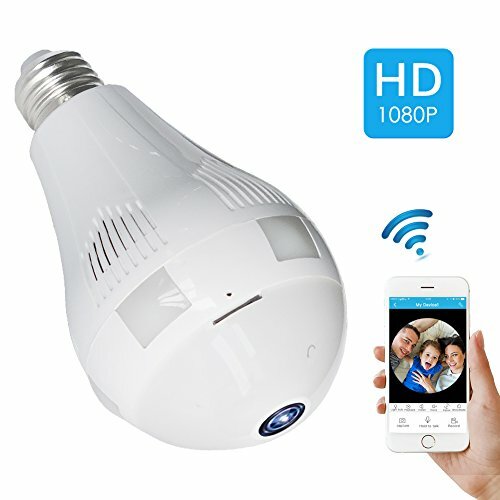 Set up this security camera in room,kitchen ,business office , shop,use free App to view anytime anywhere .It support connect 2.4G wifi (5G router don’t support) or use it on AP mode (mobile APP mode )without router. It can monitor 100㎡house . ✅[Wide Angle & Quality Video] - 360 degree wide view angle ,no blind .HD 1080P fisheye lens with 2MP(1920*1080) resolution,Clear display,say goodbye to blurred vision. You can check any details from the app .It support night vision function . When it dark ,you also can check the video clear (white & black). ✅[Two way Audio & Loop Recording ]- It built-in microphone and speaker, supports 2-way-intercom, you can communicate with your families, friends and pets on mobile devices, perfect for home security.Support 128GB Micro card (Come without TF card), This P2P camera have loop recording function , Though your memory full, it will not stop recording .It will auto cover the oldest video files. ✅[Smart Bulb] you can adjust Adjust the brightness of the bulb and remote turn on/off the light . The camera is still recording when you control the light . ✅[Insanely Easy Setup] -Never Mess with wires,screws,batteries,drills,or electricians again.Literally just twist it in to get latest smart security features100% life time Tech support and 1 year warranty .